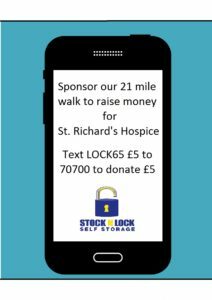 On the 6th of August, the Stock N Lock team are taking part in a sponsored 21 mile walk for St. Richard’s Hospice. We have worked closely with St. Richard’s Hospice over the past four years and will like to continue to raise money for such a good cause. Please donate as much or as little as you can to help us reach our target. We appreciate any contribution made to this worthy cause. Text LOCK65 £5 to 70700 to sponsor us today!